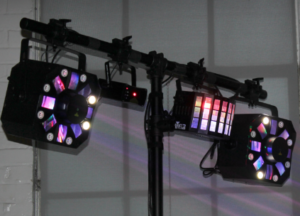 Includes all lighting from the Deluxe Package: 2 Vertical Lighting Trusses with moving-head lights. Dedicated Lighting Operator. Fog or Haze (if venue permits). 6 Wireless Uplights. See Deluxe Package info for full lighting description. 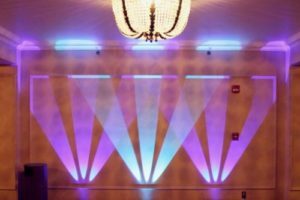 Our standard, motion dance lighting consists of 4 lights projecting from above. 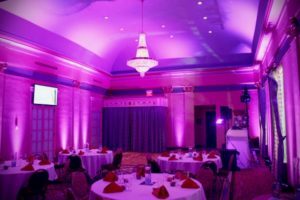 Wireless uplighting in customizable colors. They shine vertically along your walls and pillars for a captivating atmosphere. We typically recommend 6-8 uplights. Use as a stunning backdrop to your bridal table or as an accent wall. Similar to the free-standing uplights, each wireless wall art light has 3 beams of light expanding like a crown. They are best placed together in sets of 2 or 3. You and your guests can dance in a cloud on your dance floor. Please confirm compatibility with your venue prior to confirming reservation as fog or haze may not be permitted by some venues. Includes a speaker, music, a wireless mic on a stand for your officiant and a lapel mic on the groom to pick up both of your vows. Extra speaker(s) may be needed in cases where sound needs to reach to a separate area, further from the dance floor, such as cocktail hour in another area etc. Or if your ceremony requires more than 1 speaker such as in a large ballroom. Our packages include 6 hours for your reception, from the start of cocktail-hour through the last song played. After 6 hours we charge by the half hour.